Last night for a potluck party at my very close friend Sriram’s place, we were to bring ice cream for dessert. I had bought Breyers vanilla ice cream. The plan was to do something different to the ice cream and my wife suggested why not do something with rose. This is what I quickly came up with, a simple and refreshing ice cream bursting with flavor. For the rose ingredient I used Rooh Afza, a very famous rose syrup made in India. It's usually had with cold water or milk, and also added to desserts such as ice cream or milk shake. You can pick it up from any Indian grocery store. Add a pinch of saffron to 2 tbsp warm milk in a small cup and set aside for 15 minutes. Take the ice cream out of the freezer and set it at room temperature for around 10-15 minutes as well, until it is a little soft. In a medium bowl transfer the ice cream and add the rose syrup, cardamom powder, saffron with milk, and 1/4 cup pistachios. The other nuts which go well with this ice cream are cashews and almonds. 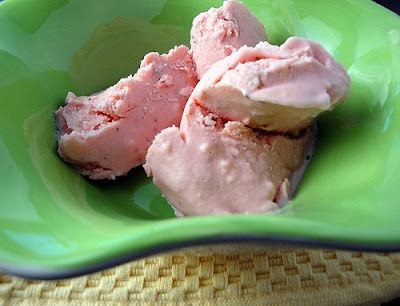 Mix the ingredients to the ice cream till it combines very well with them, smooth in texture and pink in color. Scoop the ice cream back into its container and refreeze until ready to eat. Serve this ice cream for dessert to your guests next time you host a party and wow them! If you want to enhance the flavor more, before adding them to the ice cream toast the nuts in an oven at 350 degrees for 5-10 minutes until they are slightly brown. Last weekend, our friends had come over from Long Island for lunch. We had prepared traditional South Indian dishes for the occasion with rice, sambar, potatoes, beans and fried chips. When it came down to dessert, since the triple chocolate cream pie that I had made a few weeks turned out so well, and time was a factor I thought of making another pie since I had the crust handy. I did want it to be different from the last time though. 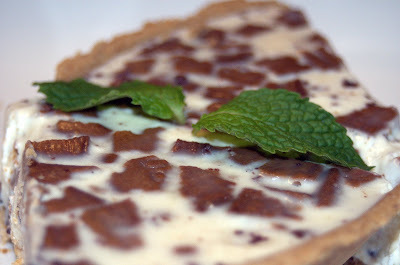 So I came up with the idea of a simple vanilla pie with chocolate biscuits and chocolate chips, with a hint of mint flavor in it. Here is the recipe. Chop the mint leaves into small pieces. In a sauce pan, pour 2 cups of heavy cream and add the mint leaves and sugar. Bring the cream to a boil and stir it to dissolve the sugar. Pour the cream into a large bowl through a strainer in order to strain the mint leaves. With your hands squeeze out any juice left in the mint leaves into the cream. Add 2 tbsp of pure vanilla extract and mix. Set aside the bowl in the freezer to cool down. I had a packet of Indian chocolate biscuit sandwiches with chocolate cream filling called Bourbon biscuits that my daughter and I love. 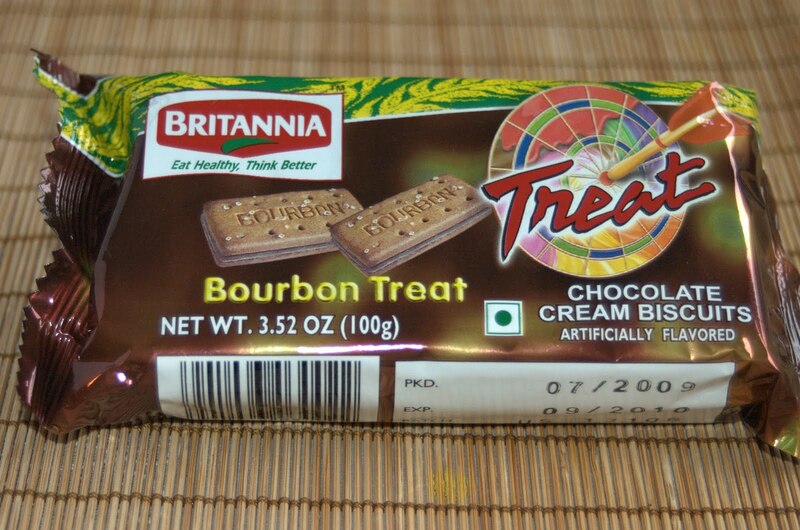 You can buy this from any Indian grocery store or you can use any substitute chocolate biscuit that you like. 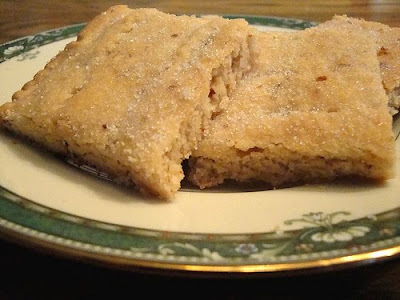 Take 4 biscuit sandwiches (8 biscuits without the cream filling) and crumble them into small pieces. Set aside. Take enough Ghirardelli (or any other good brand) bittersweet chocolate chips and chop them into very fine pieces. Measure 1/2 cup of this and set aside. After around 1 hour or so, when the cream has cooled down enough, add the biscuits and the chocolate chips to the cream and stir once or twice till everything mixes well. Pour the mix into the pie crust and freeze this for at least 5.5 - 6 hours. Garnish with mint and serve cold. Substitute Ingredient/s: My friend's son said he would have preferred semi sweet chocolate chips instead of the bittersweet as he didn't like the bitterness. You can add any kind of chocolate chips you want in this. For the biscuits Oreo cookies can be used as well but that's too common. You can add nuts as well. I avoided them as there were kids in the audience. I think Keebler Chocolate Pie Crust might work better instead of the Graham Cracker version, although the Graham cracker was good enough. One thing I would mention is that when I served this dessert, I had frozen it for around 4 hours only. So the vanilla pie was soft and hence the chocolate chips and the pie crust were interfering with the smooth texture of the vanilla pie. Since we are freezing only heavy cream here, there is no binding agent and hence it is advisable to freeze the pie for close to 6 hours so that the pie feels whole when you eat it. This salad happened by chance. I was at the local grocery store on Sunday buying vegetables for the next couple of weeks and was looking for ricotta cheese. I ended up picking a box of feta cheese thinking it was indeed ricotta cheese that I was picking up. Here comes old age. My wife called me when she left work and asked me what's for dinner. Since we wanted to prepare something real quick, I offered salad and that too Greek salad as a choice. We already had most of the ingredients, some whole wheat pita and hey, feta cheese as well. How perfect! :-) So it was decided. I picked up some oil cured black olives from the market at the Grand Central terminal in NYC. I put together the salad rather quickly after referring to a couple of books and then deciding to go my own way. My lovely wife Anita meanwhile grilled some tofu Indian style and toasted the pita bread. A few camera clicks later, we were devouring the salad away and wiped the whole salad bowl clean. Well, almost. Okay now to the fun part. Clean and chop all the vegetables into similar medium size pieces. Add the feta cheese, olives, and parsley leaves. In a small bowl, whisk together the extra virgin olive oil, ground pepper, lemon juice and salt (be careful with the salt since the feta cheese and olives already are salted). Pour this over the vegetables and mix everything together well. Serve cold. Ingredient Substitute/s: One thing I didn't add in the salad that is a part of Greek salad is wine vinegar, simply because I didn't have it. Quantity depends on your preference really. Now since I have made this once, I can't wait to experiment with different ingredients in this. Something for vegans perhaps. I had a handful of portabella mushrooms in stock. What I like about portabella mushrooms apart from their unique taste is the relatively harder texture compared to the other kinds of mushrooms. They also absorb the spices and oil flavor well. Wash the mushrooms and fenugreek leaves well. Cut the mushrooms into 1/2 inch pieces. You can even cut them lengthwise into thin long strips. Strip the fenugreek leaves off their stems, cut them fine and set aside. In a wok or something similar, add 3 tbsp of olive oil, coriander and cumin powder, and fenugreek leaves. Sauté for a couple of minutes and then add the mushrooms. Sauté the mushrooms as well for a few minutes. At this point when the frying pan is hot, start adding the cayenne pepper powder to the dry sides of the wok, above where the food is actually cooking. As soon as you put the pepper there, due to the heat of the wok, it will start smoking and will release fumes. Immediately mix the powder from the side of the wok with the vegetables. Do this a few times until all the 1 1/2 tsp of cayenne pepper powder has been used up. This semi burning process with the cayenne pepper powder that I just experimented on a whim imparted a smoky hot and spicy taste, and added great flavor to the vegetables. Hope you enjoy it. Serve with chapatti/tortilla or mix it with plain rice for flavorful 'fried rice'. I did want to mention that I found cayenne pepper rather different than the usual Indian red chilis, in that the heat from the pepper hits your tongue initially like a blast and then quickly subsides down unlike the red chilis where your mouth burns, eyes start watering and you are running around for some cold water. Based on the amount of radish we had yesterday (thanks to my innovative grocery buying) I quickly turned it into a yogurt salad (raita in Indian). Most people must be familiar with white radish. Make sure you buy it fresh and clean. Its very crispy and juicy if picked up fresh. A Chinese grocery with a lot of footprint is the best place to shop for these to ensure freshness. By the way, radish is very good for the digestive system or so i read somewhere. I eat it cause it tastes great. Here is the recipe. Clean the radish well, and chop of the leaves from the root. You don't have to throw away the leaves, as there is another great recipe for the same. My wife makes that, and I hope to post that one soon enough. Cut the radish and one half of a red onion into small pieces, around 1/8th of an inch or so. 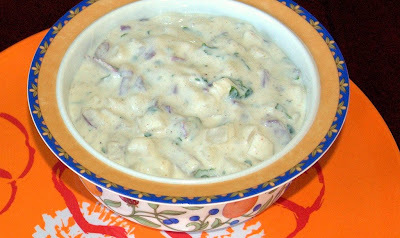 In a bowl, add the radish, onions, yogurt, salt, coriander leaves, and JalJira. Mix them well together, and refrigerate it for 20 minutes or so. Serve cold along with Chapati/tortilla, as a side dish with a meat or vegetarian dish, or just eat it as is which I do a lot of time. 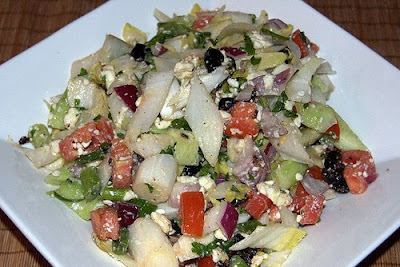 Ingredient Substitute/s: Since this is a yogurt based salad, you really can add all the vegetables that one has in a salad, BUT you have to be careful as they may not jell well enough with the JalJira. Also, yogurt can accommodate a lot of different spices and herbs, and it is always encouraging to play around with spices and see what one likes. 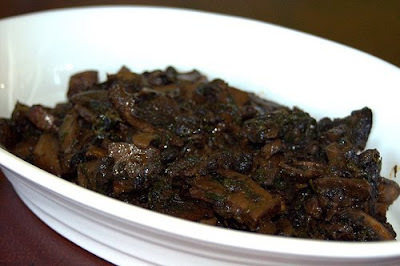 PS: JalJira is a spice mixture that is sold as a digestive aid. Usually its mixed with water and ice as a drink. It is made of salt, cumin, black pepper, mint leaves, dry ginger, chili, black salt, asafoetida, and citric acid (ingredient list right of the box that I bought). This was the dessert I made for my wife's birthday that we celebrated by cooking at home, and just got a bottle of good red wine from the shop to go along with the food. Yea, I know, I am a cheap stake. But then it gives me an opportunity to try a few dishes for the blog ;-). Now isn't that worth it? I shall post the appetizer and main course in subsequent posts, but thought that I should share this extremely simple recipe with you, what with the holidays coming soon. Based on what we had at home, I thought up this recipe and the final result was very satisfying indeed. Even my daughter who refuses to anything but vanilla ice cream, loved this. Bring the heavy cream to a boil, and take it off the fire. Break up the Cadbury's milk chocolate bar into pieces and add it to the heavy cream. With the help of a spatula, mix them together to help the chocolate melt and dissolve in the cream. Repeat the same for the bitter sweet Ghirardeli chocolates. Once the chocolates have melted completely and you have a smooth creamy mix, pour it into the pie crust. Break/crush the white KitKat chocolate wafers into very small pieces and just sprinkle them on top of the cream that is contained in the pie crust, taking care not to mix it. Freeze the pie for approximately 4 hours before serving. Guaranteed to be devoured by all! Enjoy. Health Rating: Low, but who said ice cream pies were healthy! Ingredient Substitute/s: You can experiment this any way you want - add nuts, any essence, fruits, etc. Just make sure the ingredients complement each other. I used to eat this dish a lot when I used to live in India. I used to travel a lot to Pune, the second largest city in the state of Maharashtra, and very close to Mumbai. There were a few specific Maharashtrian cuisine style restaurants that I used to frequent on every occasion in Pune. I just love the taste of Maharashtrian food, and Pune is a place that won’t disappoint you in that regard. There is one dish that I still remember from my visits that I used to relish. 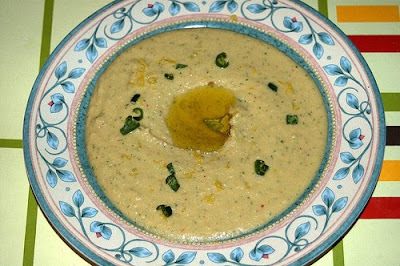 This was an usal (gravy that is made predominantly with pulses) made with black eyed beans. I recreated this dish at home one night when I was really craving that taste. I have to say that it came out fantastic. I am sharing it here. One of the main spices in this dish and in many Maharashtrian dishes is ‘goda masala’, a blend of several spices. There are several different variations to this masala or blend. The list of spices that are used to make this masala include sesame, coriander seeds, cumin seeds, cloves, lichen, cardamom, bay leaves, black pepper, and lichen. Some add coconut to this, and some do not add all the ingredients mentioned above. All of these spices are then roasted in a little oil until they are dark brown in color and then put in a grinder to make a coarse to fine powder. I usually buy readymade goda masala from a small Maharashtrian restaurant in Mumbai whose food I can’t talk enough about. I am getting the recipe from the owner that I will then provide here for everyone. One can also go to a big Indian grocery store and buy goda masala made by this company called ‘Everest’. I just stumbled upon it the other day when I was in New Jersey. I don’t know how good it tastes though. 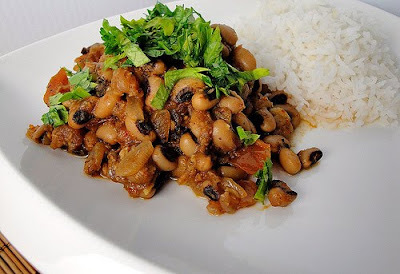 Anyway, coming back to the black eyed beans usal recipe, here’s how that came about. You can either soak the beans in water for a couple of hours and then pressure cook it (till the steam is let out 2 times by the cooker), or soak it preferably overnight and then just cook it along with all the ingredients. In a large pan add oil. Once the oil is medium hot, add the onions, garlic, goda masala, red chili powder, coconut, a little salt and let them all cook in the oil. Once you just start seeing the oil separating and the coconut starts turning light brown, add the tomatoes and continue sautéing. After a few minutes, add the beans and salt to taste, and 2 1/2 cups of hot water (or according to the consistency you want) and continue cooking on low to medium flame. If you really like the smoky flavor of the goda masala a lot, you can add another ½ tbsp of the same while the beans are cooking. Once the beans are cooked and you can taste the flavor of the spices in the cooked beans, remove the dish from the fire and garnish with fresh coriander leaves finely chopped. Serve hot with chapattis or tortillas, or with rice in which case you may want to add more water to the gravy. Ingredient Substitute/s: If you don’t have black eyed beans, you can add green moong dal, or brown lentils, or any pulse or beans you like. If you are adding kidney beans then adjust the spices and tomatoes etc. accordingly because of the thicker consistency of kidney beans compared to black eyed beans. You can also go without the coconut but I feel that the taste factor goes way down when you do that. If you don’t have goda masala or can’t procure it, you can easily add garam masala (1 tsp) along with some freshly ground (coriander/cumin/black pepper) (1 tbsp) and that should be fine, except that you really have to taste goda masala and its unique flavor along with the coconut to enjoy this dish at its best taste.